Kamohara, T. 1935. On the Owstoniidae of Japan. Annotations Zoologicae Japonenses, 15(1): 130-138. Nelson, J. S. 1994. Fishes of the world. 3rd ed. John Wiley & Sons, Inc., New York. pp. 600. Tanaka, S. 1908. 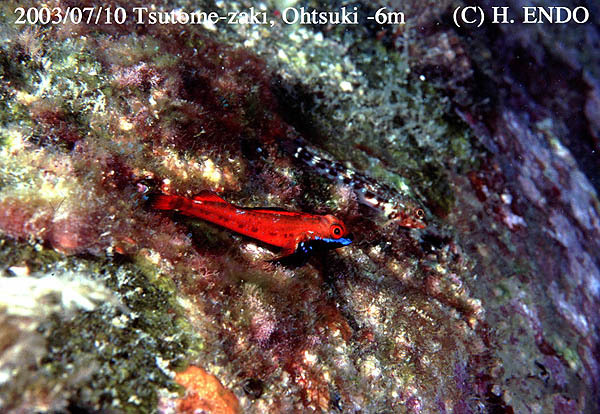 Notes on some Japanese fishes, with descriptions of fourteen new species. J. Coll. Sci. Imp. Univ. Tokyo 23 (art. 7): 1-54, 4 pls. Carpenter, K. E. 1987. Revision of the Indo-Pacific fish family Caesionidae (Lutjanoidea), with descriptions of five new species. 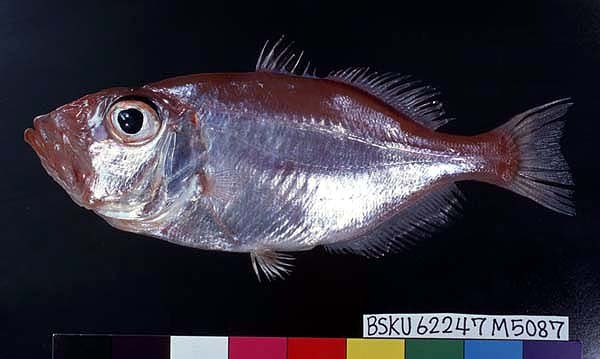 Indo-Pacific Fishes, (15): 1-56. 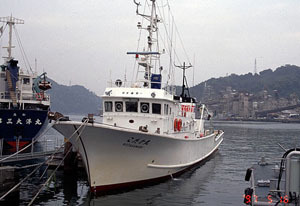 Shimada K. 2002. Lutjanidae. Pages 819-832, 1553-1555 in T. Nakabo, ed. Fishes of Japan with pictorial keys to the species, English edition. Tokai University Press. Hatooka K. 2002. Argentinidae. Pages 283, 1470 in T. Nakabo, ed. Fishes of Japan with pictorial keys to the species, English edition. Tokai University Press. Kitagawa Y. and M. Okiyama. 1997. Larva and juveniles pf the argentinid, Glossanodon lineatus, with comments on ontogenetic pattern in the genus. Bull. Mar. Sci., 60(1): 37-46. Kobilyansky, S. G. 1998. Four new Indo-Pacific species and a new key to species of the genus Glossanodon (Argentinidae). J. Ichthyol., 38(6): 725-726. Matsubara, K. 1943. Ichthyological annotations from the depth of the Sea of Japan: V. On a new microstomid fish, Leuroglossus lineatus, with an emendation on the family Microstomidae. J. Shigenkagaku Kenkyusyo. 1(1): 70-73. Aizawa, M. 2002. Malacanthidae. Pages 784-785, 1545 in T. Nakabo, ed. Fishes of Japan with pictorial keys to the species, English edition. Tokai University Press. Bauchot, M.-L., J. Daget, and R. Bauchot. 1997. Ichthyology in France at the beginning of the 19th century: the Histoire Naturelle des Poissons of Cuvier (1769-1832) and Valenciennes (1794-1865). Pages 27-80 in T. W. Pietsch and W. D. Anderson, Jr., eds. Collection building in Ichthyology and Herpetology. Special Publcation Number 3, American Society of Ichthyologists and Herpetologists. Dooley, J.K. 1978. Systematics and biology of the tilefishes (Perciformes: Branchiostegidae and Malacanthidae), with descriptions of two new species. NOAA Tech. Rep. NMFS Circular 411: 1-1-78. Imamura, H. 2000. 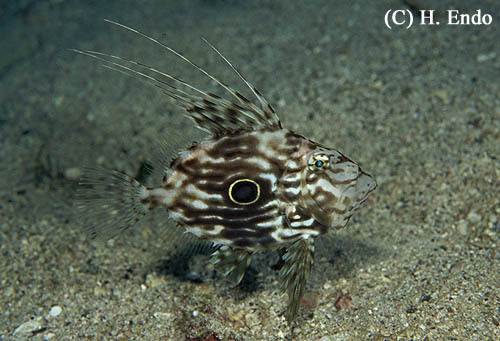 An alternative hypothesis on the phylogenetic position of the family Dactylopteridae (Pisces: Teleostei), with a proposed new classification. Ichthyol. Res., 47 (3): 203-222. Johnson, G. D. 1984. Percoidei: develoment and relationships. Pages464-498 in H. G. Moser et al., eds. Ontogeny and systematics of fishes. Based on an international symposium dedicated to the memory of Elbert Halvor Ahlstrom. Special Publcation Number 1, American Society of Ichthyologists and Herpetologists. 益田　一・ジェラルド R. アレン. 1987. 世界の海水魚. 山と渓谷社，東京．528 pp. Hatooka, K. 2002. Ophichthidae. Pages 215-225, 1456-1459 in T. Nakabo, ed. Fishes of Japan with pictorial keys to the species, English edition. Tokai University Press, Tokyo. 平田智法・山川　武・岩田明久・真鍋三郎・平松　亘・大西信弘．1996．高知県柏島の魚類相．行動と生態に関する記述を中心として．Bull. Mar. Sci. Fish., Kochi Univ., 16: 1-177. McCosker, J. E. and R. H. Rosenblatt. 1993. 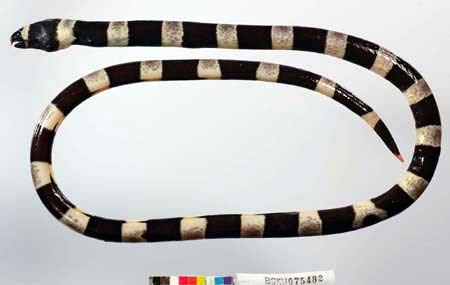 A revision of the snake eel genus Myrichthys (Anguilliformes: Ophichthidae) with the description of a new eastern Pacific species. Proc. Cal. Acad. Sci., 48 (8): 153-169, 10 figs., 3 tables. Randall, J. E. 2005. 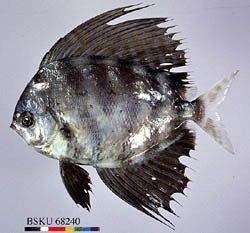 Reef and shore fishes of the South Pacific. New Caledonia to Tahiti and the Pitcairn islands. University of Hawai'i Press, Honolulu. pp.707. Shimada, K. 2002. 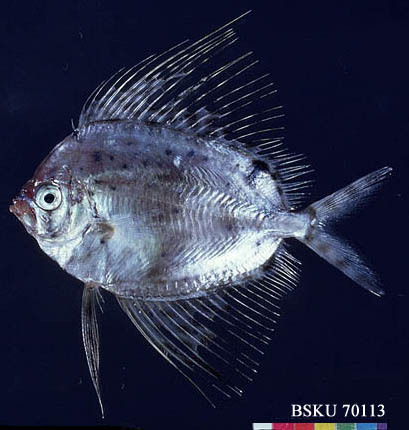 Chaetodontidae. Pages 1562-1564 in T. Nakabo, ed. 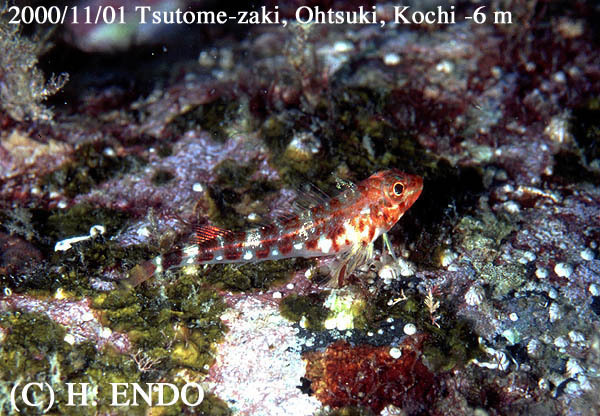 Fishes of Japan with pictorial keys to the species. English edition. Tokai University Press, Tokyo. Yamamoto, E. and S. Tameka. 1982. 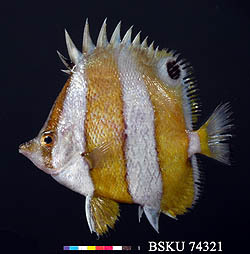 Chaetodontidae. Pages 248-251 in O. Okamura, K, Amaoka. F, Mitani eds. 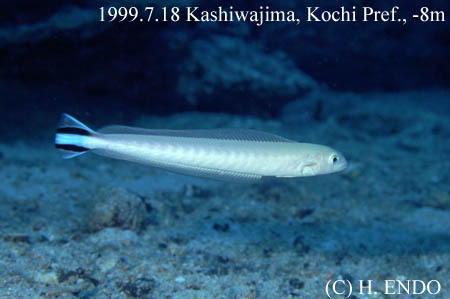 Fishes of the Kyushu-Parau Ridge and Tosa Bay. Japan Fish. Resour. Conserv. Assoc., Tokyo. Hayashi, M. 2002. Cirrhitidae. Pages 909-912, in T. Nakabo, ed. 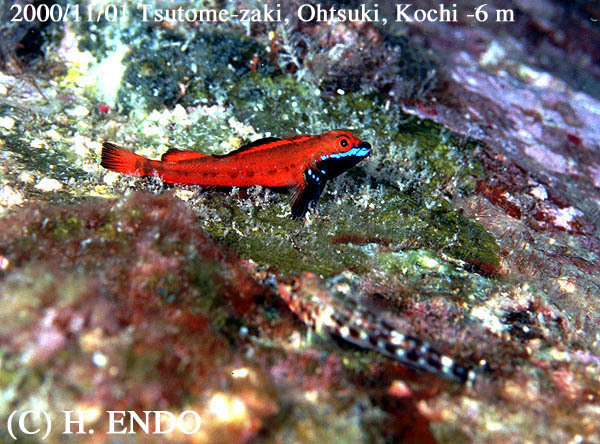 Fishes of Japan with pictorial keys to the species. English edition. Tokai University Press, Tokyo. Jordan, D. S., S. Tanaka and J. O. Snyder. 1913. A catalogue of the fishes of Japan. J. Coll. Sci. Imp. Univ. Tokyo, 33(1): 1-497, 396 figs. Tanaka, S. 1908. 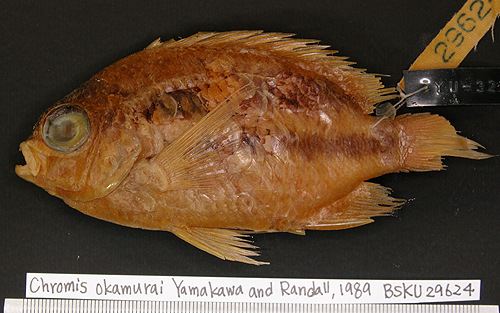 Notes on some rare fishes of Japan, with descriptions of two new genera and six new species. J. Coll. Sci. Imp. Univ. Tokyo v. 23 (art. 13): 1-24, Pls. 1-2. Heemstra, P. C. 2002. Order Zeiformes. Pages 1203-1220 in K.E. Capenter (ed. 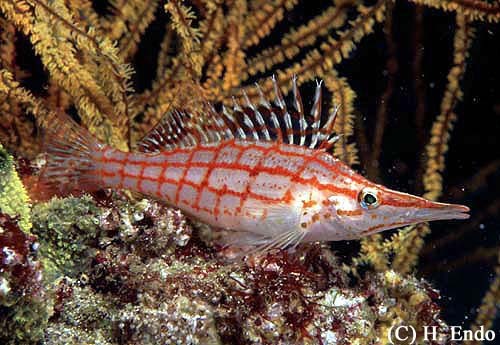 ), The living marine resourses of the Western Central Atlantic. 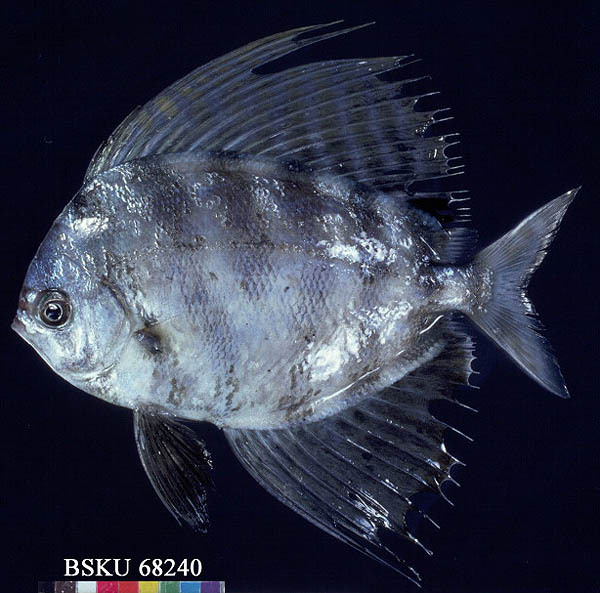 Volume 2: bony fishes part 1 (Acipenseridae to Grammatidae). 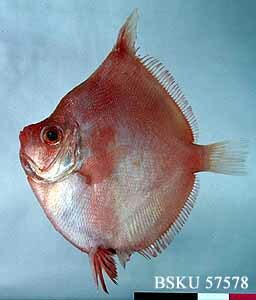 FAO species identification guide for fishery purposes and American Society of Ichthyologists and Herpetlogists special publication, No. 5. FAO, Rome. Johnson, G.D. and C. Patterson. 1993. Percomorph phylogeny: a survey of acanthomorphs and a new proposal. Bull. Mar. Sci., 52 (1): 554-626. Miya, M., H. Takeshima, H. Endo, N.B. Ishiguro, J.G. Inoue, T. Mukai, T.P. Satoh, M. Yamaguchi, A. Kawaguchi, K. Mabuchi, S.M. Shirai, and M. Nishida. 2003. Major patterns of higher teleostean phylogenies: a new perspective based on 100 complete mitochondrial DNA sequences. Mol. Phylogenet. Evol., 26 (1): 121-138. Nelson, J.S. 1994. Fishes of the world. 3rd ed. John Wiley & Sons, Inc., New York. pp. 600. Rosen, D. E. 1984. Zeiforms as primitive plectognath fishes. Am.. Mus. Novit., (2782): 1-45, figs. 1-38. Tyler, J.C., B. O'Toole and R. Winterbottom. 2003. Phylogeny of the genera and families of zeiform fishes, with comments on their relationships with tetraodontiformes and caproids. Smithsonian Contributions to Zoology, (618): i-iv, 1-110. Olney, J.E., G.D. Johnson and C.C. Baldwin. 1993. Phylogeny of lampridiform fishes. Bul. Mar. Sci., 52(1): 137-169. Temminck, C.J. and H. Schlegel. 1850. Pisces. Supplement. pp. 270-324 in P.F. von Siebold ed., Fauna Japonica . Leiden. Hayashi, M. 2002. Tripterygiidae. Pages 1077-1086, 1590-1591 in T. Nakabo, ed. 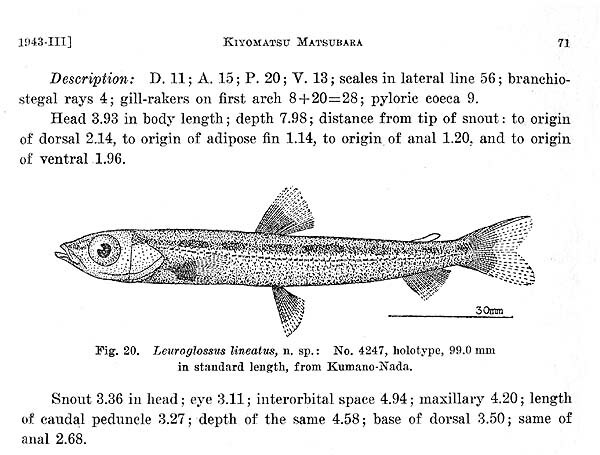 Fishes of Japan with pictorial keys to the species. English edition. Tokai University Press, Tokyo. Williams, J. T. and J. C. Howe. 2003. 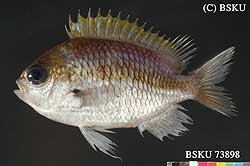 Seven new species of the triplefin genus Helcogramma (Tripterygiidae) from the Indo-Pacific. aqua, J. Ichthyol. Aqua. Biol., 7 (4): 151-176. Kamohara, T. 1960. 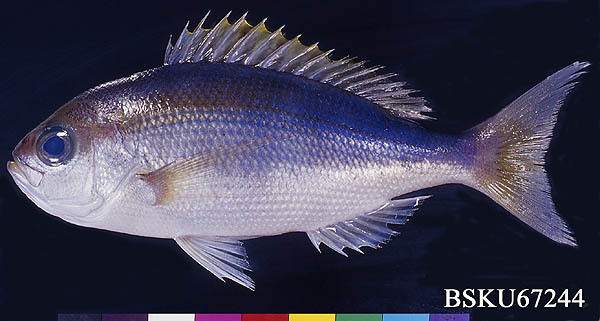 On the fishes of the genus Chromis (Family Amphiprionidae, Chromides, Pisces), found in the waters of Japan. Rep. Usa, Mar. Biol. Sta., 7(1):1-10, figs. 1-2. Nelson, J.S. 1994. Fishes of the world. 3rd edition. Randall, J. E, H. Ida and J. T. Moyer. 1981. A review of the damselfish of the genus Chromis from Japan and Taiwan, with description of a new species. Japan J. Ichthyol., 28 (3): 203-241. Shen, S.C. and .K. Chen. 1978. 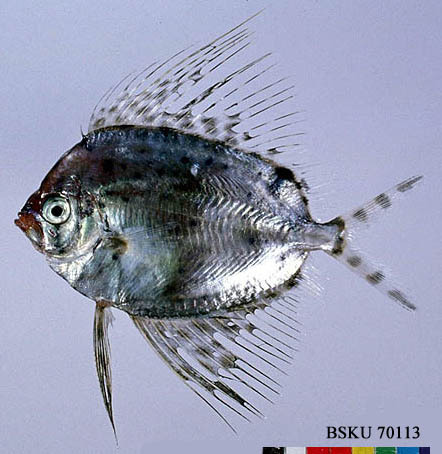 Study on the chromid fishes (Chrominae: Pomacentridae) of Taiwan. Bull. Inst. Zool. Academia Sinica, 17(1): 25-41, figs. 1-14. Springer, V. G. 1982. Pacific plate biogeography, with special reference to shore fishes. Smith. contri. Zool., (357): 75-79. Yamakawa, T. and J. E. Randall. 1989. 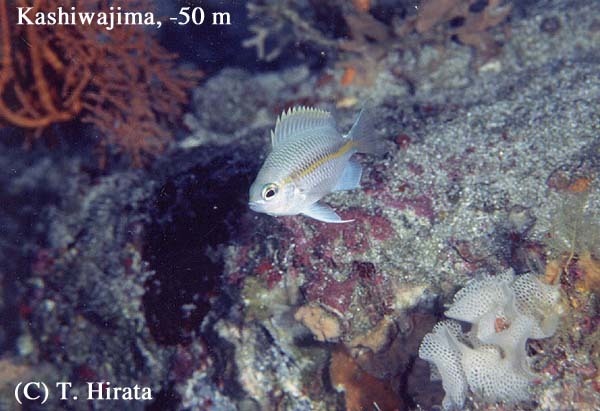 Chromis okamurai, a new damselfish from the Okinawa trough, Japan. Japan J. Ichthyol.,36 (3): 299-302. 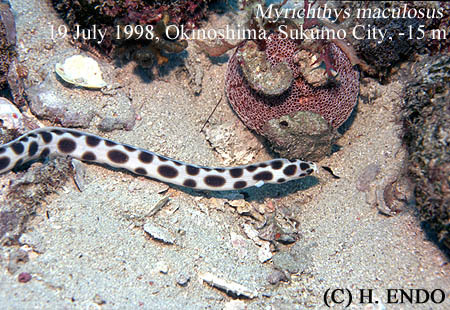 Copyright (C) 2001-2005　Laboratory of Marine Biology, Kochi Univ.